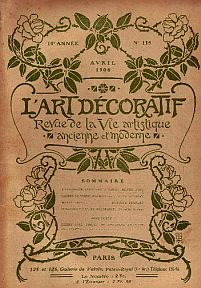 L’Art Décoratif was founded by the German writer and publisher Georg Hirth (1841-1916) as a French companion to the Munich-based decorative arts journal Dekorative Kunst. Hirth’s aim was to supply the new movement in art “with a critical theory, supporting Van de Velde and the more functional designers” [Anthony Burton ‘Nineteenth Century Periodicals’ in ‘The Art Press: Two Centuries of Art Magazines’, edited by Trevor Fawcett and Clive Phillpott. London: The Art Book Company, 1976 p.9]. The journal initially focused exclusively on contemporary decorative and applied art, however, before long it broadened its coverage to include early art and fine art. This is reflected in the subtitle it later adopted, Revue de L’Art et de la Vie Artistique Moderne.